Is it possible that when tightening the wheels, the middle section is pinched together, and the wheels cant turn freely? p.s.-can’t see the assembly real well, can i have a pic with some more light on the wheel area? In your second pic, it looks like your belt is way out of line. That’s probably not the source of your issue but it’s going to cause some inefficiency in your set up and your going to chew through belts faster than normal. Karda, what is the HP rating on the motor? 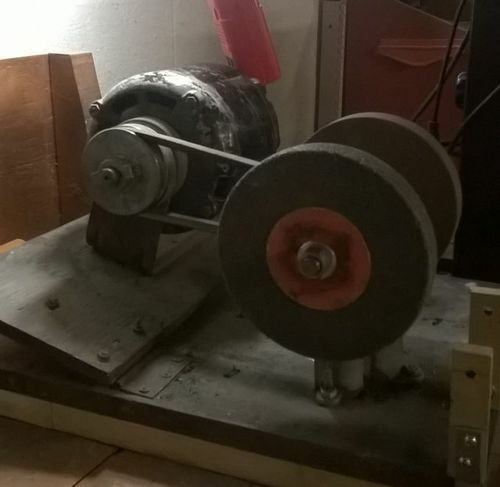 If it’s a 1/4 hp, combined with the belt misalignment, too tight a belt, and those large heavy wheels, it just might be too much for the motor. I know you stated it wasn’t too tight. What is your guide for achieving proper belt tension? 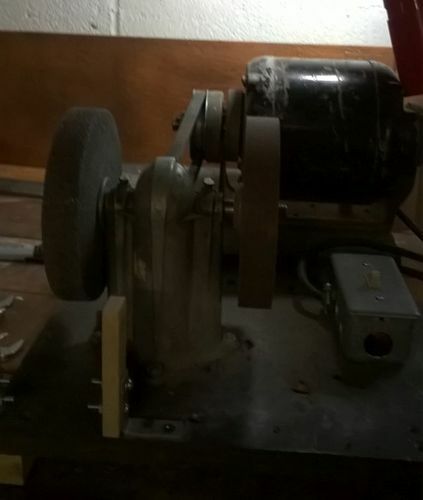 Well, since it’s a ‘homemade’ grinder, nobody should know more about it than you – unless you weren’t the one who made it. From the description, it sounds like the grinding wheel is contacting the housing – perhaps just missing a spacer or improperly placed stop collar. Would have to have a better picture to give any real advice.